Temixw provided technical support by creating a financial model and analyzing different options for pricing municipal services for leasehold interests and member housing subdivisions on reserve. the development of the Sliammon Financial Administration Law to comply with both the First Nations Financial Management Board (FNFMB) Financial Administration Law Standards, the Tla’amin Nation Constitution, and Sliammon’s unique practices and circumstances. 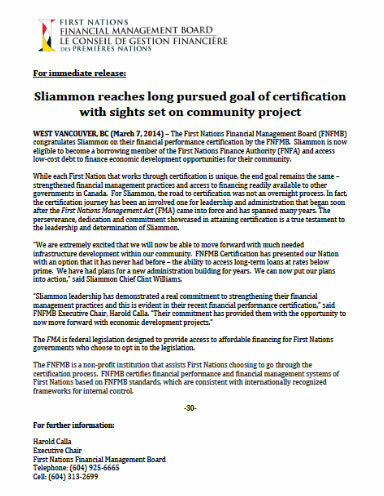 the preparation of financial reports and material required for Sliammon to achieve Financial Performance Certification from the FNFMB. the preparation of agreements and material required for Sliammon to become a borrowing member of the First Nations Finance Authority (FNFA). the preparation of communication materials and facilitation of community information sessions respecting this initiative throughout the process. Temixw supported a team negotiating an impact benefit agreement. The agreement included revenue sharing options related to five coal mines proposed within Ktunaxa territory. Temixw ran several different scenarios in a financial model and then compared and contrasted the results for the consideration of the negotiation team.